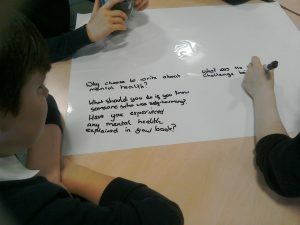 Juno Dawson’s book on teenage mental health, Mind Your Head and her frank and empathetic approach inspired librarian Shelagh Toonen and English teacher Douglas Clark at Elgin Academy to investigate mental health stigma and discrimination with an S3 class. A cross-curricular project was delivered for pupils, uniting English, PSE, Art and the Library, over four weeks, called Getting Grounded! This project focused on friendships and about talking freely and openly with friends about worries and anxieties. These feelings and the importance of friendships to mental health were captured in the form of writing and art work in a graphic/comic format. The Authors Live broadcast on 9/06/16 was extremely exciting for pupils and staff and all were delighted to see pupils’ questions, posed as tweets, answered live on air by Juno Dawson. The questions were thoughtful, sensitive and perceptive. Links with external agencies were subsequently forged and they were invited into school, to partner the group in this project. Specifically, local organisations were asked to deliver a workshop with the pupils. These were SAMH Moray and Moray Wellbeing Hub. These visitors introduced diverse ideas, such as advocacy and self-empowerment, to our young people and offered them the opportunity explore these concepts and ask questions. With these productive sessions as material, graphic novelist Adam Murphy’s visit to school was the culmination of the project. During a workshop over two periods, Adam shared his skills and expertise with the students, who developed their own mental health stories in a comics format. There was good collaboration with the Guidance team and staff were kept informed of progress within the project. They will take the outcomes of the project forward. “From my perspective, the project was extremely interesting and innovative: I have seen our pupils develop their understanding and confidence and this awareness has also impacted upon me as a school librarian. I feel that I have a better understanding of pressures facing our young people today and now look forward to developing new cross-curricular and inclusive projects with colleagues in the subject and Guidance departments”. “The Library/English Department initiative in respect of the Literacy and Mental Health project was so important, because this raised awareness of an issue which is so relevant to young people of today, while giving them a safe and supportive environment to explore their ideas and opinions. The project was enthusiastically received by the students of Elgin Academy and the participants evaluated the experience very positively”. Susan Taylor PT Guidance, Elgin Academy. Ellylee Kesson S3 Pupil Elgin Academy.